New recipes will be added as frequently as possible. 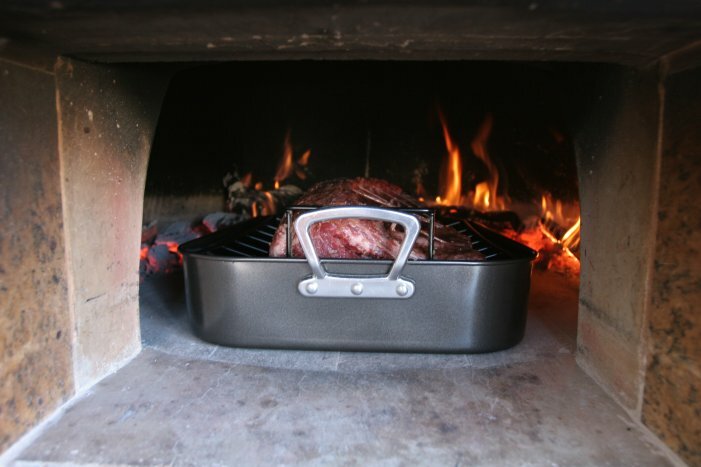 We are gathering recipes, and testing them for accuracy, so if you have a favorite wood fired oven recipe, please feel free to send it to us at info@fogazzo.com We will be sure to let you know if we use it. 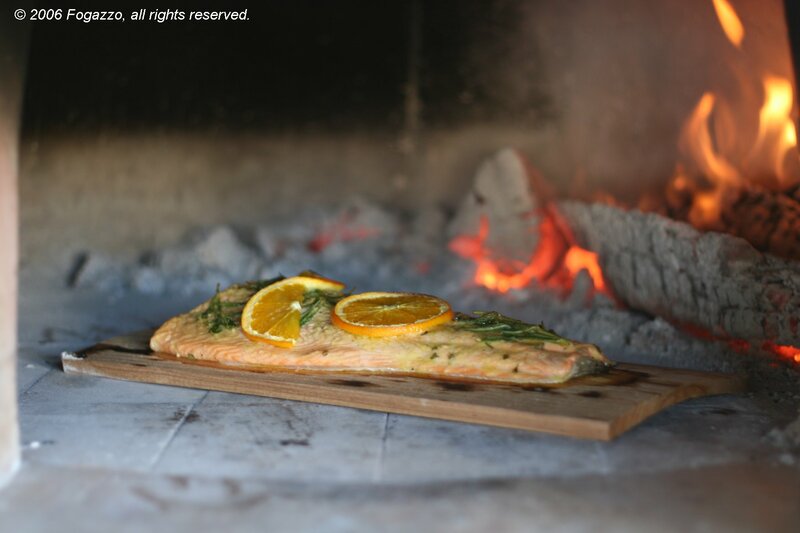 Soak the cedar plank for at least 1 hour in cold water. Preheat oven to medium heat (around 350 F). Wet your hand and wipe across the salmon to clean. Never place fish in water. Slice three thin slices from the widest part of the orange and reserve for decoration. Squeeze the juice from the remainder of the orange. In a small sauce pan, melt the butter or margarine, add all ingredients to melted butter. Place salmon with this sauce in a zip-lock bag for at least 2 hours in the refrigerator . 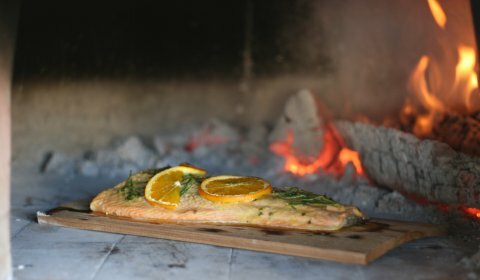 Remove salmon from bag and place on plank with the skin side down. 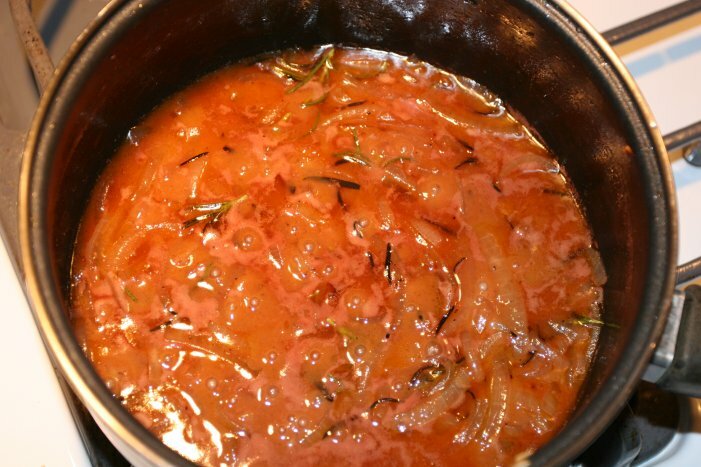 Place a couple of tablespoon of the sauce over salmon, Decorate with orange slices and Rosemary. Place the plank on the center of oven opposite the burning fire. 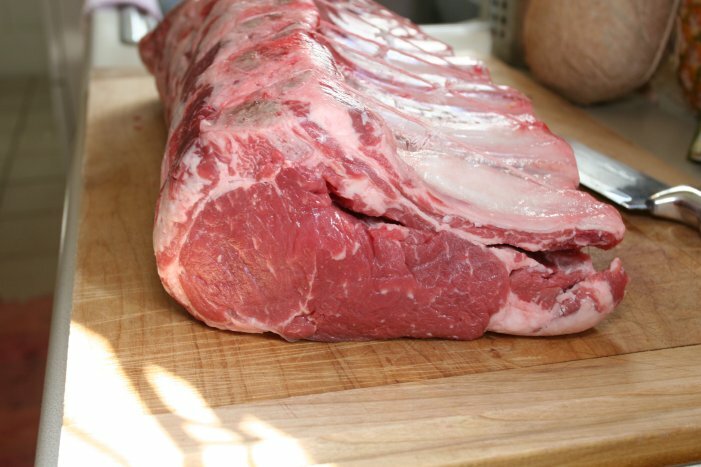 Cook for 12-18 minutes depending on size/thickness of cut. Place on serving platter or leave on plank. Careful, be sure to use a spatula,the plank will be hot! Sautee onion with a little olive oil, add butter until melted, add all other ingredients except wine, simmer for 5 minutes, add wine, and simmer uncovered over medium heat for 10 minutes. Allow marinate to cool. 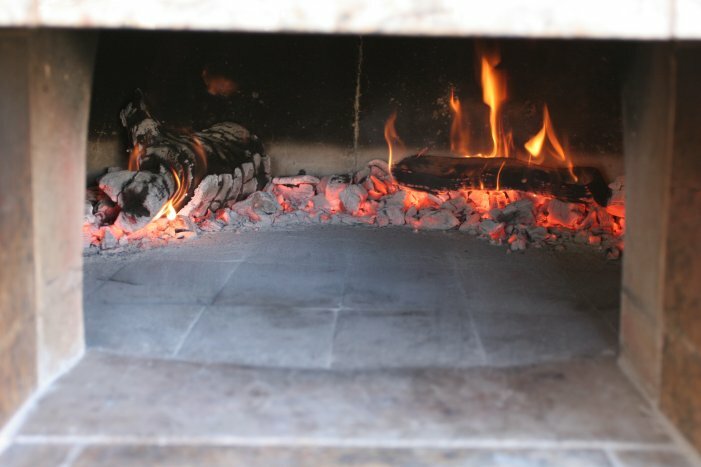 Arrange the wood fire in a half moon shape along the rear of the wood fired oven. 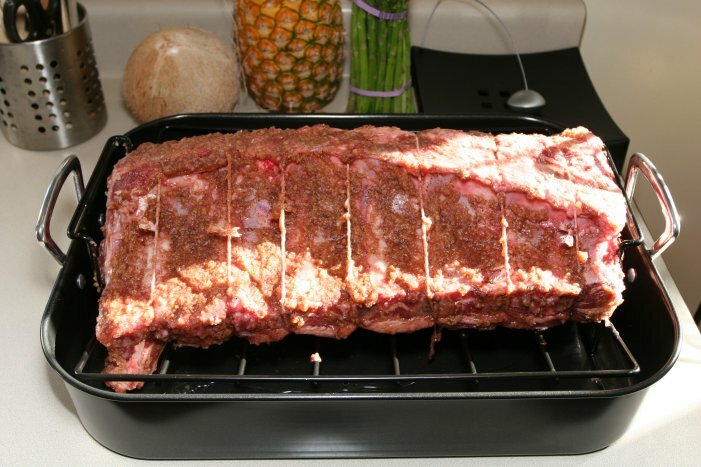 Place the roast in the oven with the rib side up, and cook over medium heat for one hour Rotate the roast 180 degrees after first 30 minutes. After the first hour, flip the roast over so that the bone side is now down and put the raost back in the oven. Cook for another hour uncovered rotating 180 degrees every 30 minutes. 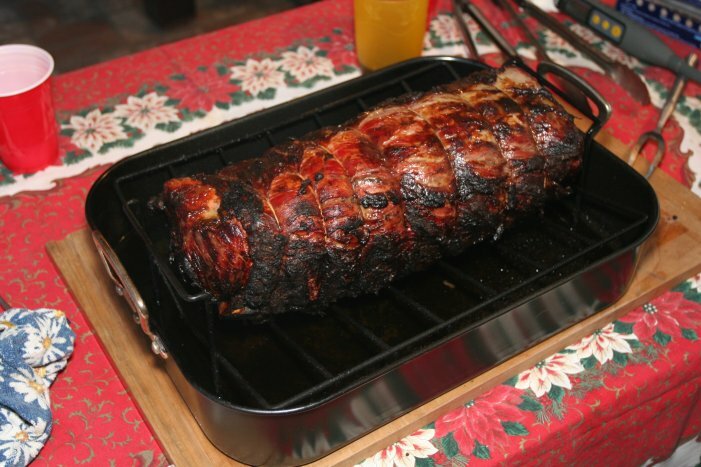 After the second hour, place aluminum foil over roast to keep it from getting too dark. At this time, place an oven safe thermometer in roast and pull it out when the thermometer reads 135 for rare and 145 for medium. 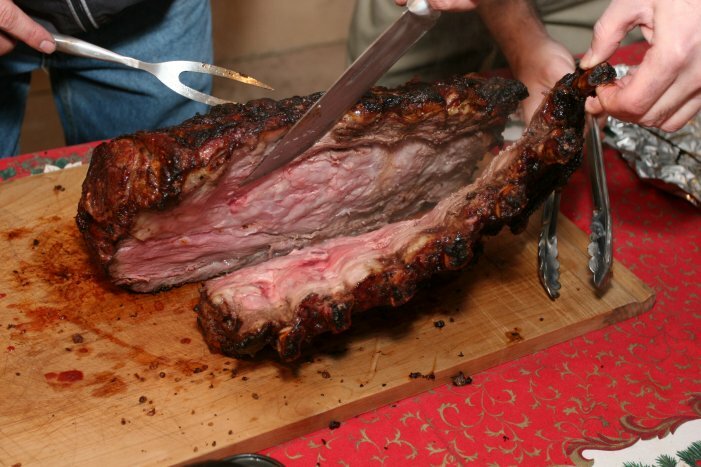 Leave roast resting for 20 minutes before carving. 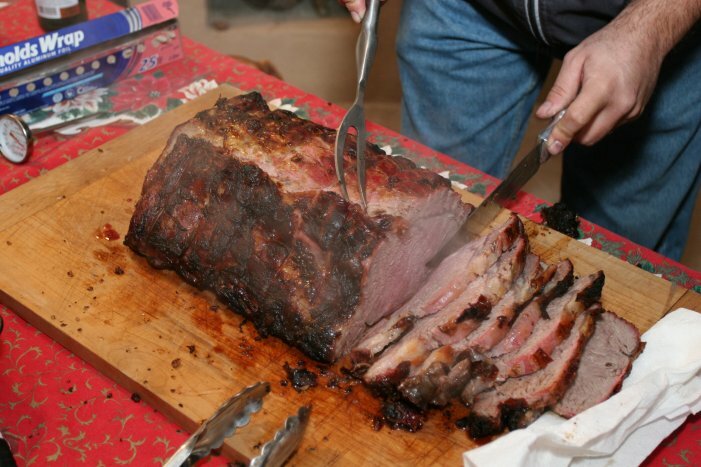 After it rests, cut off string, remove bone rack, and carve roast in 1/4 to 1 inch slices. 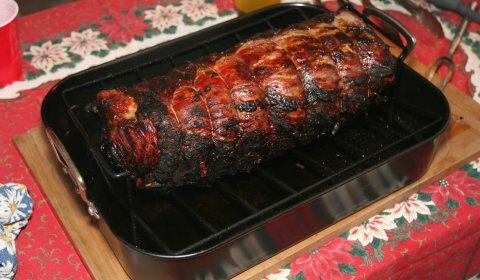 Often times one end of the roast will be more done than the other, so your guest can have a choice on how well done their slices are. In a sauce pan, melt butter, add flour and stir, add milk in ¼ cup increments until a smooth Alfredo sauce forms, add cheese and cook over medium fire until melted. Add salt and pepper to taste. Peal and cut potatoes in ¼ inch slices, cut onion in quartered slices. 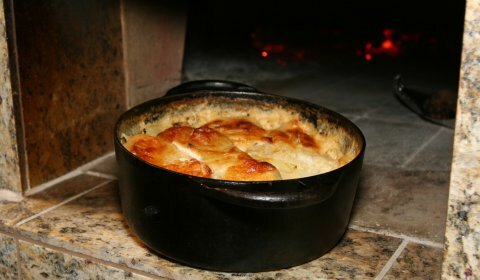 Mix potatoes, onions and cheese sauce, sprinkle Romano, Parmesan cheese mix on top and cook with a medium fire for 90 to 120 minutes.